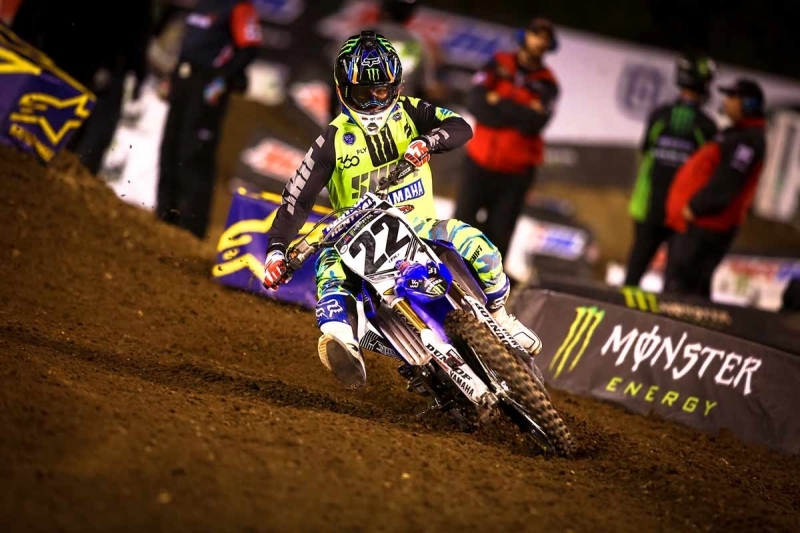 Australia’s most successful supercross racer, Chad Reed, will once again make his way down under for 2016, as he lines up for the second AUS-X Open event inside Sydney’s Qudos Bank Arena (formerly AllPhones) on November 12-13. Reed competed during both nights in 2015, and the Australian crowd favourite is excited to return for 2016. “Following a crazy couple nights of racing last year with Ricky (Carmichael) and Cooper (Webb), I’m pumped to be returning down under!” commented Reed. “It was awesome to see all the Australian fans come out and support the sport in 2015, and I’m excited to see everyone once again for a bigger and better event in 2016! For me, the ultimate race in Australia is in (Qudos Bank Arena) that stadium. I think that the track and the stadium just provide excitement. And even from my point of view, I’ve been all over the world and been fortunate enough to ride a lot of different stadiums that are considered ‘amazing’. You go to the one in Dallas; its a $1.3 billion dollar stadium, and it’s just this massive stadium with dirt in it. It’s just boring. Where you go to Sydney and it’s tight, you just never know what’s going to happen. You start and you’ve got to bash your way through. You get to go down the hallways and race there. It’s just for me, it brings excitement,” Reed added. Considered Australia’s greatest supercross rider of all time, Reed is a massive coup for event organisers, and was a major factor in the event selling out in 2015. Reed has indicated the importance of the AUS-X Open, as the racing, track conditions and competition provide a great opportunity to prepare for the succeeding Monster Energy AMA World Supercross Championship beginning in January. “The AUS-X Open is a great opportunity for us to see where we’re at – motorcycle wise and team wise. That’s what is unique about this event compared to others, is that you can actually learn a lot. When we were here (last year), we figured out a lot of things with the bike, and that put us in a great position heading into Anaheim. So we’ll look at pushing it hard and learning some things again,” finished Reed. A whole host of fast Australian’s will greet Reed at the AUS-X Open, with 2015 SX1 champion, Daniel Reardon, nine-time Australian champion, Matt Moss, and surprise AMA package, Lawson Bopping, to name a few. The AUS-X Open event is the greatest action sports competition in the Southern Hemisphere; combining an international Supercross racing event with a Freestyle Motocross (FMX) ‘Best Trick’ competition, that will feature some of the world’s best riders up against Australia’s best talent. Minister for Trade, Tourism and Major Events and Minister for Sport, Stuart Ayres said, “It’s great to see Kurri Kurri local Chad Reed returning to the AUS-X Open, which has been secured for Sydney by the NSW Government through its tourism and major events agency, Destination NSW. Again for 2016, the event will feature pyrotechnics, light and sound and first class entertainment values, all indoors in the comfort of Qudos Bank Arena; with a pit paddock area accessible on the outside of the arena for accredited fans to get up close and personal with their favourite teams and riders. A pre sale ticket list has been created for the public to sign up to, following the Saturday event in 2015 completely selling out within a matter of days.